Heartwood Carving carved decorative wood onlays, appliques, swags, scrollwork and medallions are decorative ornaments useful for bringing visual interest to flat areas. 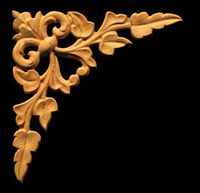 Carved onlays and appliques are often used to decorate fireplace mantels, stove or range hoods and cabinetry headers. Many sizes including wide scrolls are standardized but we can custom carve any of the products to suit your preference. Corner Onlays and appliques are traditionally used to ornament.....corners. Commonly seen in cabinet door settings but can also be used in fireplace mantels and range hoods. Onlays or Appliques (flat backed, cut outs suitable for onlaying or applying to a surface) are perfect for adding adornment by applying to an existing surface and can be glued or nailed in place. All art can be manipulated to suit your individual requirements and run to order. 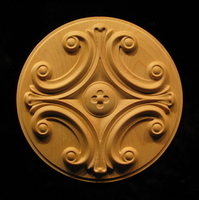 decorative carved wood onlay applique for cabinet, mantel, range hood decor.